Wow, managed to get out two weeks in a row now... and get another game in. This is the most gaming I've done in a long time. This week I faced off against Blood Angels for the first time ever. 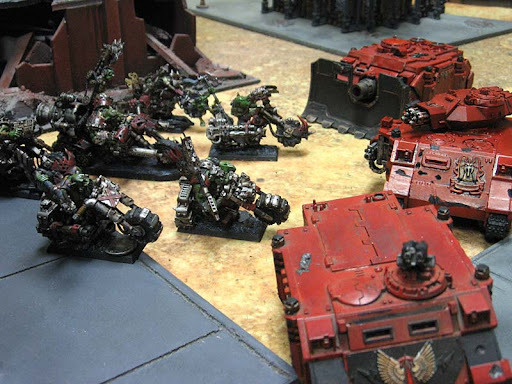 Little did I know that the Blood Angel vehicles I took some pictures of at the start of the night would be the army I'd play against a few minutes later. For those who haven't had a chance to face them, they move fast. They move fast AND can shoot which makes it worse. I'll be honest, I figured I was doomed before we started. At 1500 points, I don't have much and when I looked across the table at all the jump pack wearing, meltagun toting Assault Marines, I started to cry a little. The only thing the was going to save me was the fact we drew Annihilation with Spearhead deployment. I don't have many models and they're hard nuts to crack (unless you're running around with jump packs and a half dozen meltaguns). I ended up winning 9 KPs to 3 KPs. I saw my one opportunity at the bottom of turn two and took it. The boys in red got just a bit too close and I took the chance on assaulting them first before they closed in on me completely. 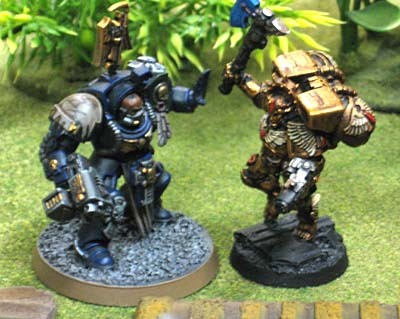 The more games I play, the more I realise Dark Angels character models just don't have the "staying power" or "survivability" that newer character models have. The new wave of Independent Characters seem to have no problem ripping through everything they touch... including my models. It takes a crazy amount of resources to bring them down. Congrats on beating the Wampire Marines! :P I am stoked that you gave 'em a beating with Dark Angels! I agree, most of the newer independent characters are rock solid beasts! The name says it all. They are rocks. Rocks unbalance a list... especially when they cost 200+ points. And you don't really realise just how far the new "characters" have evolved until you match them up against an older character. ...That's all I'm have to say.